Tampa Bay SDS speaks out against Orlando shooting | Fight Back! 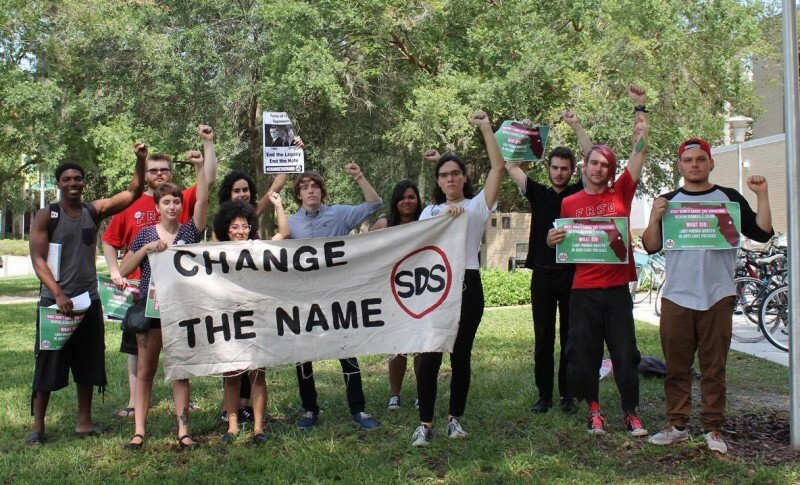 Tampa, FL – About 20 student activists from Tampa Bay Students for a Democratic Society (SDS) came together, June 24, to speak out against the Orlando shooting, homophobia and Islamophobia. The protest occurred on the campus of University of South Florida. The group of students made clear that this attack was not because of mental illness or ‘Islamic extremism’ but rather homophobia and patriarchy perpetuated by the ruling class. The group of students also called out USF’s administration and their blatant homophobia for refusing to change the name of the C.W. Bill Young Building on campus. The building is named after C.W. Bill Young a republican congressman. Bill Young was a member of the Johns Committee, a committee prominent during the 1960s which directly targeted and discriminated against suspected queer people, civil rights leaders and communists. Tampa Bay SDS will continue to fight against homophobia, Islamophobia, and USF’s administration in the upcoming semester.